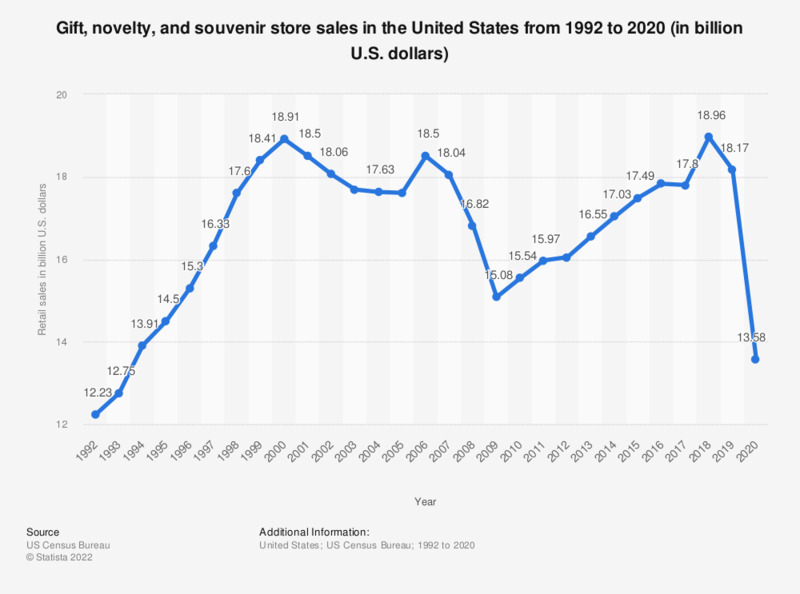 This timeline shows gift, novelty, and souvenir store sales in the United States from 1992 to 2016. In 2015, U.S. gift, novelty, and souvenir store sales amounted to about 16.8 billion U.S. dollars. The statistic above shows how sales in the gift, novelty and souvenir sector dropped following the market crash in 2008, as did retail in the United States overall. A comparison of gift purchases in 2015 between millennials and consumers aged 35 and over shows that younger people are choosing travel and entertainment over more traditional gifts than their older counterparts. Moreover, many physical gifts are not from the standard product ranges of such stores. A look at the leading gift plans among consumers in the U.S. in 2015 shows that 63 percent of consumers planned on giving clothing or accessories as a gift. Gift, novelty and souvenir stores also specialize in a number of products that are complementary to the main gift. If the trend of increasing holiday retail sales in the United States continues; sales of other products such as gift wrap, greeting cards and city specific side gifts are likely to increase. Moreover, sales may also be boosted by projected increases in international tourist arrivals in the coming years.